There is no reason why literacy has to be put on hold during the summer months with bilingual children. In fact, summer is a perfect time to give home and school languages the undivided attention they deserve. Without the need to focus on homework and after school activities, bilingual children and parents can have a wonderful time with literacy. It doesn’t take a lot of work. It just demands a good set of resources to work with and the willingness to follow through. As we mentioned in a previous post, the languages of a bilingual child are not in competition. Exposure to both is important and essential. We use language(s) to make meaning of our world around us and to communicate this meaning to others. It doesn’t matter in which language a child learns about her community and her world; once she learns about it in one language, she can transfer this understanding to her other languages. This is true when learning about how languages work as well. Yes, there is different vocabulary and grammar in each language but the underlying concepts of literacy are the same. To keep literacy alive during the summer months, it doesn’t really matter which language is spoken at home. What matters most is that parents are engaging their children in activities that will encourage and strengthen language and literacy overall. A child who is read to every day in any language will reap tremendous benefits, ones that reach beyond pure linguistic elements. Ultimately, literacy is about comprehension. It is about understanding the meaning of what is written on a page. Vocabulary and grammar are essential parts of this but any teacher can tell you about students in class who read perfectly but don’t actually understand what they are reading. Parents can ensure that this doesn’t happen to their children by engaging their children in literacy activities that stimulate comprehension. Encourage parents to read out loud: Let parents know that reading to their children in their home language is essential. Remind parents that everything that their children hear and learn at home in the home language can and will be transferred to the school language. No matter how old children are, they are never too old to listen to parents and teachers reading books out loud. Encourage parents to listen: Help parents become comfortable with the concept of listening to their children read out loud in both the home language and the school language, even parents who don’t understand the school language very well (or at all). Children should feel comfortable sharing school interests and books with their parents, regardless of language. Ideally, teachers can send children home with bilingual books so that the parents can understand what their children are reading. Encourage parents to feel empowered: Make sure parents understand the important role they play in their children’s literacy success. Some parents may feel that learning to read is what goes on in school and that parents don’t have much of an impact. Let them know that this is not true. Help them to understand that the more parents do to engage their children at home in literacy activities, the more their children succeed in school. Parents want to know that their role in their children’s education is essential, regardless of the home language. It is important that teachers tell parents this over and over again in positive, encouraging ways. Encourage parents to participate: Parents often don’t know how, exactly, to help their children succeed in literacy. Give parents handouts with specific instructions and tips on how they can keep language alive during the summer. Share what students have been learning during the school year so that parents can continue to talk about the same concepts during the summer months. Is there a good series of books that you recommend that children read during the summer? Tell parents about these books and help them find them in the home language so that parents can read them out loud all summer long. Give parents as many specific details as possible so that they won’t have to spend a lot of time making decisions in areas that they may not feel comfortable. These are just a few ways that teachers can help parents keep their bilingual children’s literacy alive this summer. 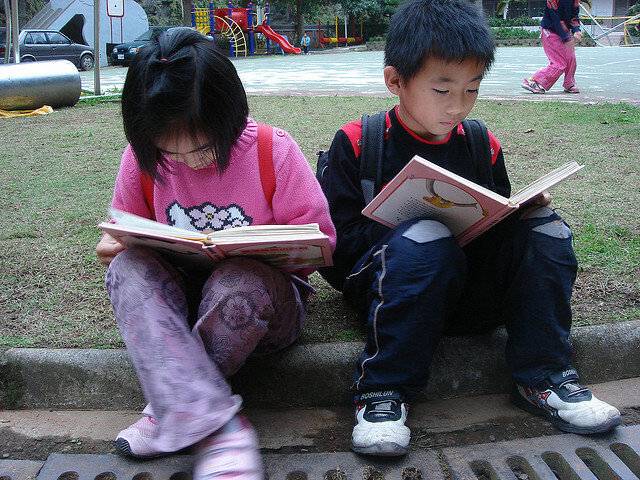 Reading in any language benefits bilingual children in so many ways. Aside from the cognitive and linguistic benefits, it opens up new worlds for children. Reading books gives children the opportunity to experience life through the eyes and skin of someone else. Bilingual children can become pioneers traveling west, detectives on the case of a missing wallet, or elegantly dressed dancers waltzing at a ball. For bilingual children in particular, books can help them feel that they belong in a given culture or environment. Experienced through the eyes of characters in a good book, a bilingual child can actually come to feel comfortable with cultural aspects which were before unknown or intimidating. Help parents pick out books that will give their bilingual children these positive opportunities to experience what it is like to live in different cultures. Show parents how they can encourage discussion with their children to help them understand and internalize what they are reading. Parents and teachers can give bilingual children the opportunity to fall in love with books and reading this summer, regardless of language. Entice children with books on topics that they adore and who knows, they may not even want to stop reading long enough to play that new video game at their neighbor’s house!